Dubai Airport has specified Bright Green Beam™ for new and refurbished signage throughout the airport. 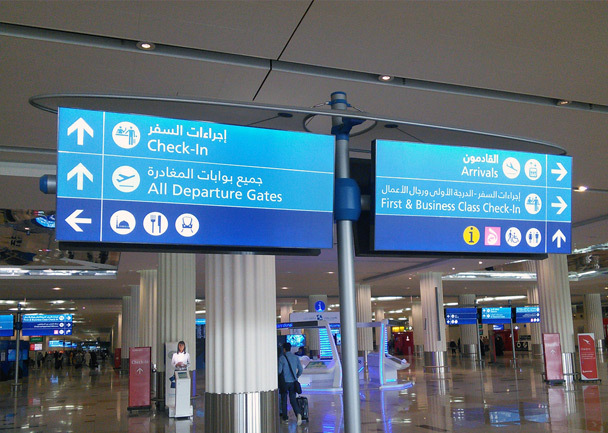 So far the project has seen our LED system installed into over 1000 signs in Terminal 3, the exclusive Emirates terminal. Bright Green Beam™ has been specifically designed to be energy efficient, easy to install and ‘no maintenance’ compared to traditional fluorescent tube lighting, reflecting the needs of the busy, round-the-clock airport terminal. Dubai Airport, already the world’s busiest airport in terms of passenger numbers, is undergoing significant development to deliver their ambitious 2020 expansion plans. Specifying Bright Green Beam demonstrates the company’s commitment to quality – the modules provide bright, even, illumination and the controlled LED binning ensure the signs look consistent throughout the terminal.